Last August, the 12-member bipartisan Joint Select Committee on Deficit Reduction — also known as the "super committee" — was tasked by Congress with proposing a way for the federal government to spend at least $1.2 trillion less than it was projected to spend over the next decade. Writing in the Washington Post shortly after the committee was created, Alan Simpson (a former Republican senator from Wyoming) and Erskine Bowles (who served as chief of staff to President Bill Clinton) exhorted the group to "go big, be bold, and be smart." The targeted reduction — $1.2 trillion — was not enough, they argued; instead, the committee should aim for $4 trillion. This was not the first time that the $4 trillion figure had been cited as the reduction needed to address the federal government's fiscal problems. On December 1, 2010, the bipartisan, White House-sponsored Commission on Fiscal Responsibility and Reform, co-chaired by Simpson and Bowles, called for $4 trillion in cuts over the next decade. On April 5, 2011, Paul Ryan — the Wisconsin Republican who heads the House Budget Committee — released The Path to Prosperity, a plan for cutting $4 trillion in federal spending over the next ten years. Later that spring, provoked by the Ryan-led GOP challenge, the White House and congressional Democrats outlined possible alternative paths to $4 trillion in "savings" through a mix of tax increases and spending cuts. Despite the broad support for $4 trillion in cuts, none of these proposals has gained enough traction in today's divided Washington to be enacted. Indeed, the super committee did not even manage to come to agreement on $1.2 trillion. But imagine for a moment that the more aggressive budget cutters had gotten their way, and that Congress and the president had somehow managed to agree on $4 trillion in cuts over the coming decade. Would that reduction have actually pumped the brakes on "big government" in America, or thrown its post-1960 expansion into reverse? Hardly. In its 2011 Budget and Economic Outlook document, the Congressional Budget Office projected that the federal government will amass average annual deficits of more than $600 billion in the decade ahead. Thus, even if $4 trillion in cuts were implemented over that period, Washington would still add at least $2 trillion to the debt. Moreover, those CBO figures are based on best-case projections about growth in government revenues. Analysts who have used CBO's own "alternative fiscal scenario" — which employs more realistic projections based on past trends — forecast yearly deficits closer to $1 trillion, on average, over the next decade. If they are right, then even with $4 trillion in cuts, we would still add at least $6 trillion to the debt. Split the difference between the two forecasts and we face $4 trillion in additional debt over the next decade, even after making the cuts that today's most aggressive fiscal hawks suggest. The problem grows even worse when one focuses on the obvious (but often neglected) fact that total government spending in America includes not only Washington's outlays but also those of state and local governments. In 2008 — the last fiscal year before the federal government increased spending in response to the recession — state and local governments combined spent a total of about $2.8 trillion and had run up more than $2.6 trillion in debt. Indeed, our sub-national governments are in no less fiscal trouble than Washington is; by some measures, their prospects are much worse. For instance, only nine states can now claim a bond rating of triple-A, and dozens of cities and counties are facing bankruptcy crises and are operating in the shadow of billions of dollars in unfunded public-employee pension liabilities. Yet in the face of these mounting fiscal woes, debt-ridden Washington and semi-solvent state and local governments will be spending more, not less, over the coming decade. The federal government is on course to spend at least $4 trillion a year, on average, in the next ten years. In the same period, combined annual state- and local-government spending will average at least $3 trillion. Combined government spending will thus average at least $7 trillion in each of the next ten years, for a total of at least $70 trillion over the decade. Faced with a $70 trillion government, extolling $4 trillion in cuts over the next decade as a "go big" approach to debt reduction is, frankly, ridiculous. The unpleasant truth is that our government is much bigger than even our fiscal hawks generally acknowledge, and reducing its size will be much harder than any politician is willing to admit. America's citizens and politicians willfully ignore this reality. Their avoidance is made possible, in part, by the fact that government's true size is easily obscured. Our very big government is not simply a collection of public programs administered by an army of public employees: It is a vast and complex array of public and private institutions, for-profit and non-profit corporations, contractors, agents, and facilitators. An accurate measure of government's full scope is thus very difficult to come by. Above all, though, we ignore the real size of our government because we want to. The past half-century of American political rhetoric clearly demonstrates that Americans like to say they disapprove of big government. The last half-century of American political reality, however, clearly demonstrates that Americans don't want to give up the benefits big government provides. This hypocrisy not only leaves us unable to actually restrain the size and scope of our government: It also prevents us from doing the next best thing, which is looking for ways to make a very large government at least function more efficiently and successfully, perhaps delaying fiscal disaster. The nation's dire circumstances demand better of us. And to meet that demand, we must begin by facing reality: Big government is here, and it isn't going away. America's gargantuan government is not a recent development. It is not simply the doing of Barack Obama or of George W. Bush. It is the result of a transformation in our expectations of government — one that dates back at least half a century. Adjusted for inflation, the size of the federal budget today is more than five times as large as it was in 1960. The growth over these years has been steady: In 2011 dollars, the federal government spent roughly $712 billion in 1960. In 1970, it spent $1.2 trillion; in 1980, $1.7 trillion; in 1990, $2.3 trillion; and in 2000, $2.5 trillion. In 2007, the last year before the Great Recession, the federal government spent $3.3 trillion, and in 2010, it spent roughly $4.0 trillion. State and local spending, meanwhile, rose from about $384 billion in 1960 to about $2.3 trillion in 2009, both in 2011 dollars. From 1980 until the onset of the latest recession, annual growth in per-capita state and local spending was not far behind that in annual per-capita federal spending. By 2011, total yearly government spending was about $20,000 per person. Of course, our overall economy has also grown significantly in that time, and one could argue that a wealthier country will naturally have a more extensive and expensive government. The size of the federal budget is therefore often assessed in relation to the nation's gross domestic product. But by that measure, too, government is significantly larger than it used to be, and the growth pattern confirms that our massive government is not a recent phenomenon. 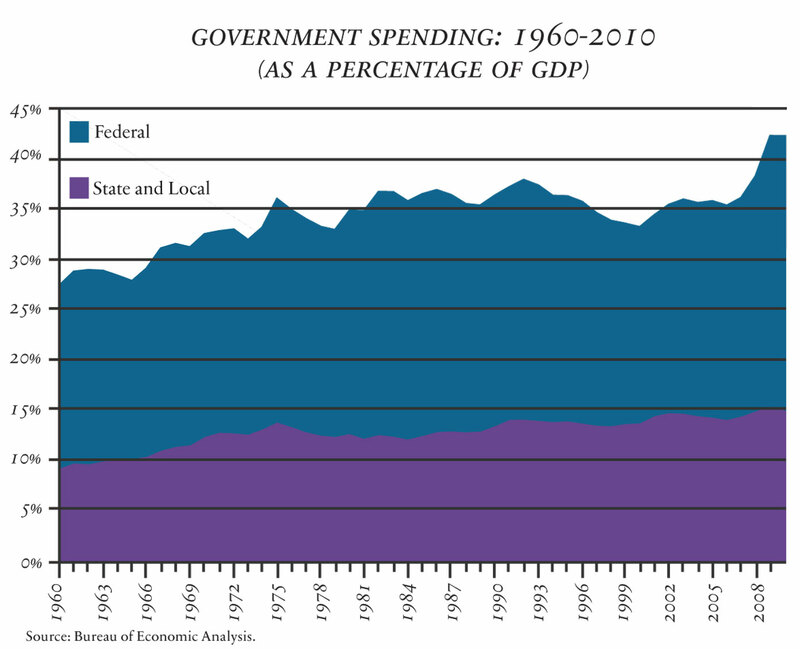 In 1960, federal spending accounted for roughly 18% of the nation's GDP. Over the subsequent two decades, the government grew a good bit faster than the economy. Federal spending reached about 21% of GDP at the beginning of Jimmy Carter's presidency in 1977. It then grew at roughly the same rate as the (fairly healthy) economy for several decades: Though federal spending spiked to nearly 24% of GDP in 1983, it was back around 21% when Ronald Reagan ended his presidency in 1989. It was about 22% when Bill Clinton began his presidency in 1993, and about 22% when George W. Bush ended his in 2009. State and local outlays followed a similar trend: In 1960, state and local spending totaled just under 10% of GDP. It grew to 13% of GDP in 1977, and then to about 15% of GDP in 2008. In other words, our government expanded steadily in the 1960s and '70s and has not shrunk since, swelling along with a growing economy year after year. All told, between 1960 and 2010, America's total annual government spending (federal, state, and local) rose from about 27% of GDP to about 42%. Obviously, the past few years have involved some extraordinary spending measures at the federal level. In February 2008, the cost of the first recession-related stimulus bill came in at $124 billion over ten years. In October 2008, the tab for the Troubled Asset Relief Program came in at $700 billion. In February 2009, the American Recovery and Reinvestment Act authorized $787 billion in spending over 11 years. All the while, GDP was barely growing. Thus, by the end of 2010, federal spending as a percentage of GDP had reached a post-war peak of more than 25%. This increase in federal spending has had a major effect on the national debt. Between the end of 2008 and the end of 2011, gross federal debt — the amount the government owes its creditors plus the amount it owes its own trust funds — grew from $10.7 trillion to $15.2 trillion. That increase — $4.5 trillion in debt over just three years — is more than the total amount of debt amassed by the government in the nation's first two centuries. It also means that, for the first time since just after the Second World War, our gross debt is the same size as our entire economy. Add our annual debt per capita (about $49,000 in 2011) to total annual government spending per capita (about $20,000 in 2011), and we have a rough "big government index" of nearly $70,000 per year for every man, woman, and child in this country. But while the budgetary effects of this recent spike in spending will endure for some time, most of the outlays were temporary. The recent binge is by no means the primary reason for the gargantuan scale of today's federal government — or for the projections regarding the scale of tomorrow's. To be sure, America is not the only democracy in which post-1960 government spending has soared. But Americans too easily assume that our government is still smaller (in relative terms) than those of other developed nations. It is not: Today, per-capita government spending in the U.S. is higher than it is in France, Germany, or the United Kingdom. And America's debt-to-GDP ratio is now higher than those of most European democracies, and higher even than the average for Latin American nations. None of this bodes well, of course, for America's global competitiveness in the years ahead. Of late, there seems to be a heightened awareness in our national politics of this looming fiscal crisis. But for all the noise, no one is actually talking about solutions that would truly restrain (let alone reverse) the growth of government. Consider, for instance, a 2010 report by the National Research Council and the National Academy of Public Administration, which examined several scenarios for reining in federal spending over the next couple of decades. One of the report's proposals involved cutting Social Security for 70% of retirees, cutting projected spending for Medicare and Medicaid by 20% for each program, and cutting all other federal programs by about one-fifth. Given the projected increases in federal spending on those and other programs, however, all these cuts — plus some revenue increases proposed in the report — would result only in bringing federal spending down to 21% of GDP. Such a reduction would shrink the federal government's size relative to the economy to the level not of 1960, but of 2008. And yet even this minor paring was dubbed by the report as the "extreme scenario." Other supposedly bold budget proposals — like those put forward by House Budget Committee chairman Paul Ryan in April 2011 and by Republican presidential aspirant Mitt Romney in November 2011 — would reach roughly the same level of federal spending. Even were Washington this very day to initiate the cuts contemplated in these proposals — and even were state and local governments this very day to freeze their per-capita spending at 2010 levels — a decade from now, federal-government spending would still equal about 21% of GDP. Total government spending would still equal about 42% of GDP. Is there no way, then, to make a real dent in the scope of American government? One might as well ask whether most Americans and their elected leaders are now talking seriously about significantly smaller fiscal footprints for Social Security, Medicare, and Medicaid; much smaller state-prison populations; lower per-capita local expenditures on public schools; fewer and smaller government contracts with for-profit corporations that employ millions of people in areas ranging from national defense to human services; sizable reductions in government subsidies and grants for non-profit organizations that also employ millions of people; significantly shorter rations for scores of millions of low-income people of all ages who depend on government for their income, housing, or daily bread; and so on. The fact is that most Americans, not to mention their elected leaders at every level of government, are unwilling, except in the abstract, to entertain the idea of such cuts. We are nowhere near prepared to prescribe, much less to vote for and live with, the fiscal and programmatic equivalent of gastric-bypass surgery for big government. One key reason why we are unwilling to seriously reduce the size of our government is that its scope and reach are even bigger than the daunting spending figures suggest. For many people, big government is personal: Millions of Americans either make their living from government or have family members or friends who do. In addition to the 3.2 million personnel who work for the U.S. Department of Defense (the world's largest employer, followed by the Chinese army and Wal-Mart), American government now employs more than 20 million full-time or part-time civil servants, only about a tenth of whom are full-time federal bureaucrats (indeed, all of the real post-1960 growth in government employment has been at the state and local levels). The various public-employee work-force reduction plans launched by state and local governments since the recession started have so far resulted in only tiny actual cuts. And the proposal made by House Republicans in 2011 to eliminate 200,000 federal civil-service jobs, meanwhile, exempts "critical" and "security" personnel; as several analysts have noted, even if it were approved, this proposal would end up cutting only about 70,000 federal jobs over a period of many years. Beyond those Americans employed directly by the state are the employees of businesses and non-profit organizations paid or subsidized by one or more levels of government to help administer programs in defense, homeland security, health care, consumer-product safety, environmental protection, and so on. Indeed, big government in America involves far more than government: It involves Big Inter-Government (BIG) plus BIG's Private Administrative Proxies (PAP) and their non-government but tax-paid employees. Let's call it BIG PAP for short. One policy domain that is easy to situate within BIG PAP is defense. Even before President Eisenhower's warning in 1961 about the "military-industrial complex," some private corporations functioned almost exclusively as defense contractors, and a great many more do today. Lockheed Martin Corporation alone has often had more than $35 billion in defense contracts in a single year, and about 70 other firms do $1 billion a year or more in defense business each. The U.S. military also contracts with organizations ranging from non-profit universities to for-profit security firms. Led by the Massachusetts Institute of Technology's Lincoln Laboratory, hundreds of American colleges and universities have had one or more defense contracts. In 2008, some 20 different private security contractors operating in Iraq employed about 10,000 people and provided the Department of Defense and the State Department with armed security personnel, intelligence analysis, and more. Speaking at the National Press Club on September 14, 2011, Marion Blakey — president and CEO of the Aerospace Industries Association — stated that the "aerospace and defense industry supports 2.9 million jobs across all 50 states," and that more than 1 million of those jobs are "direct, industry jobs." Citing possible deep cuts in defense spending, Blakey urged federal lawmakers to "consider whether eliminating hundreds of thousands of jobs over the next decade is at all consistent with the national imperative to create jobs." BIG PAP also involves de facto government workers in myriad policy domains beyond defense. For instance, in 2010, several members of the Senate committee that oversees the Department of Homeland Security expressed concern that the department employed more private contract employees (about 200,000) than federal workers (about 188,000). Medicaid relies extensively on networks of private for-profit and non-profit medical practices, hospitals, nursing homes, and billing agencies for its everyday administration. Big-city governments administer federal-state welfare-to-work programs, job training, youth and family services, and a host of other human-services programs through long-term contracts with both for-profit and non-profit organizations. There are countless other examples in every area of federal-, state-, and local-government work; BIG PAP is hiding in plain view. It is lurking, for instance, in the heart of the Environmental Protection Agency. Since 1990, the EPA has had between 16,000 and 18,000 full-time personnel. Yet over the past two decades, the EPA has nonetheless started many new programs and greatly expanded its regulatory reach by collaborating with 50 EPA counterpart agencies in the states, and by hiring tens of thousands of private contractors. The EPA's contractors have answered its Superfund hotline, advised businesses about which projects might be eligible for government funding, and even developed the EPA's own official criteria for deciding which program functions it ought not to contract out. BIG PAP is also between the lines of the American Recovery and Reinvestment Act of 2009, which funneled $275 billion of its almost $800 billion in spending through more than 80,000 contractors and grant recipients. And BIG PAP stares Americans in the face every time they walk into any of the nation's more than 9,000 federal buildings, guarded as they are by the Federal Protective Service with its roughly 1,225 federal employees and 15,000 or so private security guards employed through contractors. Setting aside national defense, the non-profit sector is an even bigger part of BIG PAP than the for-profit business sector is. In 2009, the organizations recognized as non-profits by the Internal Revenue Service reported nearly $1.9 trillion in spending while holding $4.3 trillion in total assets (for comparison, the total assets of state and local governments were about $4.6 trillion). In total, the non-profit sector employed about 13.5 million people (roughly a tenth of the American work force) and accounted for about 5.5% of GDP. About three-quarters of non-profit organizations, including most faith-based ones, spend under a half a million dollars a year and receive little or no government grant or contract money. But the quarter of the sector's organizations that boast its biggest annual budgets are highly dependent on direct government funding, meaning that one-third of all non-profit dollars are from government, paid through grants or contracts. For instance, in 2009, Catholic Charities USA alone spent $4.2 billion — and about two-thirds of those expenditures were funded by government grants and contracts. Over the past quarter-century, government grants to non-profit organizations have nearly tripled (in inflation-adjusted dollars). And just as businesses lobby to keep government contracts flowing, non-profit organizations lobby to preserve government grants and to block measures to limit itemized deductions in the federal tax code. For instance, in November 2011, Independent Sector — an umbrella advocacy organization that represents hundreds of non-profit leaders — rallied members to send a message to Pennsylvania's Republican senator Pat Toomey, who was then a member of the super committee and pushing for deep spending cuts. Their message: More than 650,000 Pennsylvanians are employed by non-profit organizations. When all of this is taken into account, BIG PAP looks staggeringly immense. It represents some $7 trillion a year (and counting) in spending, more than 20 million public workers, and millions more de facto government employees in the business and non-profit sectors. It consumes more than 40% of GDP, and is on track to push the national debt above $20 trillion by the year 2020. BIG PAP's ongoing growth is particularly startling when one considers that, in every public-opinion poll, mistrust of government is at an all-time high. The last thing Americans want, it would seem, is an ever-larger state. For instance, in 2011, Gallup polls indicated that barely 10% of the public approved of Congress, that a record-high 63% had a negative view of Washington, and that more than three-quarters of registered voters thought that most members of Congress do not deserve to be re-elected this year — the highest anti-incumbent percentage since Gallup began asking the question in 1992. Similarly, a 2011 Rasmussen poll found that a record-low 17% of voters felt "the federal government has the consent of the governed," and that 38% (a plurality) said they wanted the federal government to become "inconsequential" in American life. And a 2011 New York Times/CBS News poll found that a record-high 89% of Americans said they "distrust government to do the right thing." But what people tell pollsters is one thing; the reality of life for most Americans is quite another. From pensioners to pre-schoolers, from private contractors to prisoners, Americans by the scores of millions are dependent on BIG PAP. About 60 million people receive Medicaid benefits; about 54 million people receive Social Security benefits; about 48 million people receive Medicare benefits; about 45 million people receive food stamps; about 7 million people are in prison, in jail, on probation, or on parole; more than a million have de facto government jobs in the aerospace and defense industries; more than 200,000 paid staff, more than 900,000 children, and more than a million volunteers — including "volunteers" paid and deployed by the federal Corporation for National and Community Service — are involved in Head Start; and on and on. Many Americans sincerely feel that the ideal of "We the People" is in tension with "big government," but We the People are big government — in the form of BIG PAP. The reality of our dependence on the state and its proxies, broadly understood, results in a profoundly contradictory attitude about government. We don't trust it, we don't like it — but we don't want it to change. We want to cut government, but we don't want to cut the programs on which government actually spends money: defense, assistance to the poor, and benefits for the elderly. As a result, we imagine that there are massive savings to be found in unpopular corners of the budget. The sad truth, however, is that those savings do not exist beyond our imaginations. Consider Social Security. According to a 2011 report by the program's trustees, Social Security now provides the majority of income for about half of all Americans over the age of 65. By 2020, we would have to more than double the Social Security payroll tax to avoid falling 25% short (or more) of what would be needed to cover the 90 million beneficiaries that Social Security will be supporting in 2035. And according to a 2011 report by Medicare's trustees, that program will be insolvent in about a decade if big changes are not made soon. These are the facts, yet a majority of Americans of all ages tell pollsters that we should essentially leave these massive components of BIG PAP untouched. According to a January 2011 poll by the Kaiser Family Foundation, only 8% of Americans favor "major reductions" in Social Security benefits, and only 8% favor "major reductions" in Medicare benefits. Making "minor reductions" is more popular, but still not favored by anywhere near a majority in either case: 27% for Social Security, 35% for Medicare. Indeed, most Americans tell pollsters that they are convinced that deep cuts to these and other popular government programs could be avoided, and substantial savings realized, if only the programs were managed more efficiently and all the "waste, fraud, and abuse" in them eliminated. But this is simply not true: Social Security is justly considered by non-partisan experts to be one of the most efficiently administered of all government transfer-payment programs. And Medicare's total administrative overhead costs are about 5%, which is less than comparable rates for many large private insurers. Indeed, both Medicare and Medicaid are centrally managed by the same federal agency (the Centers for Medicare and Medicaid Services) and its roughly 5,000 government workers, which means that about a quarter of the entire federal budget is managed by fewer employees than work for Princeton University. To be sure, there is "waste, fraud, and abuse." In 2011, the Government Accountability Office estimated that Medicare makes at least $48 billion in "improper payments" each year, part of a conservatively estimated $125.4 billion a year in improper payments made by the federal government as a whole. But even saving the entire $125.4 billion every year would do little to close the government's enormous fiscal gaps. Besides, nobody at the Government Accountability Office or anywhere else has yet figured out how the flow of improper payments can be reliably stopped. By the same token, the Internal Revenue Service estimates that the tax gap — defined by the IRS as the difference between what taxpayers are required to pay and what they actually pay on a timely basis — is about $400 billion a year. Congress has considered many different approaches to going after tax delinquents, but the reason the revenues are not in the federal Treasury is that nobody has yet figured out how to cost-effectively (and constitutionally) deter, detect, and collect non-payments. Similarly, over the past half-dozen years, state Medicaid anti-fraud units stepped up their efforts and more than doubled the amount of money recovered each year, from nearly $600 million in 2004 to nearly $2 billion in 2010. This is good news, of course. But even if the war on Medicaid fraud were to yield double that amount annually for the next ten years, the crushing financial problems that the more than $400-billion-a-year program faces would be lightened only imperceptibly. It is true that if the federal government became fraud-proof, stopped all improper payments, and collected all delinquent taxes, the federal Treasury would net more than $4 trillion over the next ten years. But not only is such a scenario a pipe dream, it would also make very little difference to public finances. As we have seen, cutting or saving even $4 trillion over ten years would not begin to get BIG PAP's spending under control. The fact is that we will not bring that spending under control because we do not really want to. Americans went to the polls two dozen times in the half-century period that began in 1960 and saw immense growth in the size and cost of government. And in those two dozen plebiscites, the average re-election rate for House incumbents was 93%, and the average re-election rate for Senate incumbents was 82%. Indeed, most House incumbents won re-election by wide margins even in those years when party control of the House changed (1994, 2006, and 2010). In 2010, despite all the polls broadcasting intense opposition to "big government," deep disapproval of Congress, and a strongly anti-incumbent mood, 87% of House incumbents who sought re-election won it, as did 84% of Senate incumbents. So we hate Congress yet love our own representatives. We curse "big government" while coveting its benefits and demanding its services. We fully embrace a complex government financed through deficits and administered through maze-like networks of federal grants and contracts, sub-national civil servants, for-profit contractors, and non-profit grantees. The result is a democratic polity in which most people claim to resent the growth of government, all the while expecting, wanting, and voting for government to help protect and take care of their children, their parents, and themselves. This self-contradictory attitude has yielded an even bigger state than we likely would have if Americans had simply and openly approved a large and ever-expanding government. For instance, America would almost certainly have a smaller government than it does today if, by means of some traditional political norm or by some constitutional provision, every post-1960 federal policy, program, rule, or regulation had to be administered directly and exclusively by full-time federal bureaucrats. The use of sub-national civil servants, private contractors, and non-profit grantees to carry out federal laws — a practice surely intended to restrain the size of government — has instead inflated the state and given rise to four sets of perverse, if unintended, consequences. First, this practice has limited the number of federal bureaucrats but vastly increased their discretionary power to pay subsidies to favored groups and individuals, to transfer money among and between different levels of government, and to devise and enforce regulations applying to every sector of society and every facet of the economy. Between 1960 and 2010, the number of federal bureaucrats remained fairly flat while the number of pages added to the Federal Register (which records all new rules and regulations) increased more than five-fold (from about 15,000 pages to about 80,000). Second, it has made Americans ever less aware of just how much they rely on government. Beneficiaries of both Medicare and Medicaid, for example, generally get their benefits — from doctor visits and prescription drugs to home nursing and hospice care — without ever seeing a single actual government worker. The same is true of many other government programs. After touring an inner-city church complex and its faith-based programs with me in 1996, a prominent conservative U.S. senator exclaimed how he wished "government could do programs like that." I did not have the temerity to tell him that the programs he had seen and praised were, in fact, largely funded by government; he just couldn't tell by seeing them at work. Third, the peculiar way in which we have expanded our government has created an intergovernmental lobby consisting of governors, mayors, public-school superintendents, state directors of public health, county highway commissioners, local police chiefs, entrepreneurs, non-profit executives, and diverse government grantees. The intergovernmental lobby is big government's constant supplicant and apologist. For instance, ever since "homeland security" got its own federal department in 2002, states and cities have lobbied Washington for their fair share of that department's money. In 2010, a series of articles in the Washington Post detailed how more than 500 new private companies specializing in homeland-security work came into being after the attacks of September 11th, and how another 1,400 or so for-profit firms that did such work before 2002 had expanded. Private universities and other non-profits, too, have chased homeland-security grants for research, training, and programs. But this is just BIG PAP's history repeating itself. The intergovernmental lobby has pushed for the creation or expansion of federal laws for decades — interstate-highway laws starting in the 1950s, "war on crime" laws beginning in the 1960s, education laws commencing in the 1970s, expanded housing policies in the 1980s, disability policies in the 1990s, and, in addition to homeland security, expanded prescription-drug coverage and other health-care laws in the 2000s. Fourth, the growth patterns of government have undermined what seemed to be a sure-fire strategy for reining in federal spending. This is the story behind successive political pushes to "block grant" federal programs. Compared to categorical grants (which are very specifically allocated federal funds), block grants afford state and local governments more discretion when it comes to the financing and administration of federal programs. Between 1966 and 1993, 23 federal programs were administered via block grants. Most notably, during the Reagan presidency, Republicans and a few centrist Democrats — preaching fidelity to federalism and promising net decreases in government spending — succeeded in consolidating 77 categorical-grant programs into nine block-grant programs in areas including community development and social services. In 1994, Republicans came to power in the House of Representatives following 40 straight years of Democratic control. The "Contract with America" on which the GOP had nationalized the election called for eliminating numerous federal agencies and programs, and for a "devolution revolution" involving more block-granting. Between 1995 and 2010, block grants grew in fits and starts, but they did nothing to slow spending at all levels of government — for as the number of block grants grew, so did the number of categorical grants. Per-capita spending on each type of federal grant program grew as well. And in the few social-policy domains where block grants did actually slow or reduce federal spending, state and local governments responded with replacement funding that, when all the intergovernmental dust settled, increased, rather than decreased, overall public outlays. Not one major federal bureaucracy was abolished; most grew. And with the sole exception of the Aid to Families with Dependent Children welfare program in 1996, no major federal programs were eliminated. And even that exception needs an asterisk. At its height in the mid-1990s, AFDC accounted for about 1% of total annual federal, state, and local government spending. Moreover, AFDC was immediately replaced by a block-grant program called Temporary Assistance to Needy Families. Under TANF, welfare caseloads shrank, courtesy of stricter eligibility rules and time limits on receiving benefits. But by 2000, TANF's real per-capita spending actually exceeded AFDC's, and state and local governments not only supplied replacement funding but also provided recipients with new program-related auxiliary services such as education, job training, and day care. It seems, then, that even those policies ostensibly aimed at restraining the growth of government often end up enabling its expansion. Our cries for controlling spending thus ring hollow, and both parties find ways to ignore the reality of government's growth, arguing for a smaller state while creating an ever-larger one. In 1996, President Bill Clinton famously declared that "the era of big government is over." In the same speech, he also declared that "there is now broad bipartisan agreement that permanent deficit spending must come to an end." He was, of course, wrong on both counts. The era of big government is a half-century old and looks to be here to stay. And this is because everyone in our politics — from dedicated liberals to die-hard libertarians — has a hard time acknowledging BIG PAP for what it is, preferring to avoid an honest assessment of its political, financial, and administrative realities. In 2010, the liberal Century Foundation released Deficit Disorder: Sense and Nonsense about the Federal Debt. It was a "guide to the issues" booklet that dismissed the concerns expressed by "deficit hawks" and others "preoccupied with budget short-falls." The booklet's tone augured the following year's party line among leading liberal pundits and Democratic public intellectuals, which was that far-reaching reforms of the welfare state were largely unnecessary. After all, their argument went, simply letting the tax cuts enacted during President George W. Bush's administration expire, and going back to the federal tax rates that were in place on President Bill Clinton's last day in office, would "save" about $4 trillion over the next decade. There are valid reasons to favor going back to the Clinton-era tax rates. But even if such a move were to generate $4 trillion more in tax revenues over the next decade, it would by no means obviate the immense funding challenges bedeviling Medicare and Medicaid, or save Social Security, or return the nation's debt-to-GDP ratio to an economically sound level, or otherwise secure our fiscal future. To insist otherwise is simply to deny reality. Conservatives and libertarians, meanwhile, make an equal and opposite error about the implications of their recent proposals for spending cuts. Even if the supposedly transformational budget proposed by House Republicans were to be enacted in full and to have exactly the effects that the Congressional Budget Office optimistically projects, it would reduce projected federal spending by only $4 trillion over the coming decade, and so make only a minor dent in the size and scope of our government. Conceding that the federal portion of our burgeoning government might be a lost cause, in 2011, some fiscal conservatives looked to the states. They found hope in what Republican governor Chris Christie was doing in New Jersey, what Democratic governor Andrew Cuomo was up to in New York, and what Republican governor Scott Walker tried in Wisconsin. But these examples, too, show how stubbornly intractable our enormous government really is. After eight years in which the Garden State's budget had increased by an average of about 3% per year, Governor Christie cut New Jersey's 2012 budget by 2.6% — about a billion dollars shaved from a budget of nearly $30 billion. And even Christie's cuts were too much for many voters. In the November 2011 elections for the state legislature, amid a record-low voter turnout, the Democrats maintained their majority. Several well-financed, Christie-backed, fiscally conservative Republican candidates were easily defeated. In New York in 2011, Governor Cuomo negotiated a three-year plan to cut state spending on public employment and pensions by about $450 million. But he also increased spending on several programs, and firmly backed the White House in opposing further cuts in federal spending on Medicaid and other major intergovernmental programs. Meanwhile, as Wisconsin faced a $4.2 billion deficit for 2012 and 2013, Governor Walker proposed reductions that would not quite cut that deficit in half. The political melodramas that followed his proposals sparked a movement to recall him and obscured the fact that his plan would still keep the Badger State's budget ink running red for years to come. Naturally, it is difficult to shrink government in times of crisis. But it has been no less difficult in times of relative plenty and ease. In the mid-1990s, for instance, the National Commission on State and Local Public Service issued well-received bipartisan reports on fixing state- and local-government finances and administration, including a special report on health-care reform. I was a member of the commission, and it was an exciting and hopeful time. Numerous governors and mayors signed on. President Clinton embraced the commission's recommendations at a White House ceremony. At the same time, Vice President Al Gore was leading the "reinventing government" effort, searching for ways to "make government work better and cost less," as he put it. Some good things happened, including money-saving changes to certain federal procurement practices. But in the end, the federal, state, and local financial and administrative reforms did not amount to much, and most did not stick anyway. Courtesy of this liberal-conservative consensus — tax less, spend more — BIG PAP is with us to stay. And denying this basic reality works to the advantage of no one. In fact, it does a great deal of harm — by keeping us from thinking rationally about how to manage the government we have, and by preventing us from taking up real problems of public administration that are actually within policymakers' power to solve. Can nothing be done? Surely, Americans could improve BIG PAP — maybe shrink it a bit, and possibly avert fiscal disaster — if we could still somehow practice what James Madison preached about government. In Federalist No. 63, Madison stressed that "there are particular moments in public affairs when the people," filled with "errors and delusions" and having been unduly impassioned or "misled by the artful misrepresentations of interested men," need "the interference of some temperate and respectable body of citizens" to protect them from themselves "until reason, justice, and truth can regain their authority over the public mind." But the outlook is not bright. We have a deficit-financed, proxy-administered mess of a big government, and neither party in either chamber of Congress tells the whole truth about it. We entered the current election season with many "conservative" GOP presidential aspirants, not one of whom uttered a single serious word about rolling back public spending or about improving public administration. We also entered the year with a sitting Democratic president who ignored his own "moment of truth" commission and, even more disheartening, has said and done nothing meaningful to prevent Medicare from a near-term financial implosion. And our public discourse about government is dominated by television, radio, and internet chattering classes featuring pseudo-intellectuals and ideological purists of all stripes whom Madison would instantly recognize and disparage as "theoretic politicians." About the only people who regularly see and speak about our situation for what it is are the best of the traditional, non-partisan public-administration scholars. Promising work is being done by, for instance, H. George Frederickson of the University of Kansas and the University of New Hampshire's Melvin J. Dubnick, who recognize the dangers posed by the collaboration between our vast intergovernmental apparatus and its private administrative proxies. In a 2011 National Academy of Public Administration report, the two did not shy from challenging conventional wisdom about the relative inefficiency of bureaucracies, citing empirical evidence that "direct government programs operated by civil servants" outperform otherwise comparable government programs administered by private proxies. And yet, Dubnick and Frederickson noted, such "direct government programs" are few and far between — the exceptions to the rule in American government. As long as we are living with BIG PAP — which seems to be the intent of both voters and politicians — we must encourage investigations like the one undertaken by Dubnick and Frederickson. Specifically, our scholars of public administration have an obligation to ask, and seek answers to, five sets of very basic questions. First, even as the urgent and overriding imperative is to reduce government spending both in absolute terms and relative to GDP, how do we rationally rate the risks associated with underfunding things like public infrastructure? For instance, in 2011, the American Society of Civil Engineers warned Congress that millions of Americans will face routine disruptions in their water supply and risk being exposed to sewage bacteria unless we begin to spend the more than $600 billion it will take to repair the nation's most decrepit water and sewer systems (like the 19th-century pipes that carry water to most of Washington itself). Second, exactly how does BIG PAP spend all that money — more than 40% of America's GDP and counting? More specifically, what is the relationship, if any, between the sheer rate at which it spends and the character and quality of its proxy-government administration? Are there consistently better and worse models for channeling public funds? Third, how do the employees of our federal, state, and local governments manage, monitor, assess, and correct the same governments' respective private administrative proxies? In particular, have "performance management" laws like the federal Government Performance and Results Act of 1993 made a real difference? Fourth, how does BIG PAP establish, finance, and administer human-services policies and programs for low-income citizens? It is one thing to witness government agencies struggling with highly complex tasks administered through intricate intergovernmental networks involving non-governmental grantees and contractors. But why does our current system, even at the local level, so often fail when it comes to such seemingly simple tasks as deploying a registered nurse to a nearby old-age home or preparing, boxing, and trucking lunches to neighborhood food-distribution sites? Fifth, what, if anything, might be done to get more public value from the heavily subsidized non-profit sector? Remarkably, for all the scholarship on non-profits, there is almost no research that analyzes the sector's evolution in relation to the public purposes repeatedly cited as justifications for its near-constant expansion. In Federalist No. 10, Madison warned that "[e]nlightened statesmen will not always be at the helm." Today, his observation remains painfully true, and even the most public-spirited academics are not enlightened statesmen. Absent Madisonian political leadership at the helm of our institutions at this moment of public peril, honestly answering public-administration questions about BIG PAP will do very little to shrink the size of government or to avoid fiscal catastrophe. Still, such open-eyed realism could contribute somewhat to improved governance and public management, save us a little money, better an untold number of lives, and buy us some extra time. It could also help us be better informed about the challenge we confront if those enlightened statesmen ever do arrive to take the helm. That is hardly a satisfying solution to our present dilemma, but given the scale of our predicament, we must do what we can. John J. DiIulio, Jr., is a member of the National Academy of Public Administration. Over the past three decades, he has taught American government at Harvard, Princeton, and the University of Pennsylvania.